Ready-to-use Kits for classes, subjects, courses, teachers, classrooms, grades, periods, blocks, tracks, students, etc. ; These kits tackle them all. School principals tell us that displaying their color coded magnetic master class schedule to their associates, quickly spotting conflicts and making fast changes is much more effective than any computer system. Based on their requests, we offer here school master scheduling board kits in a wide variety of class period formats plus kits for student progress tracking, equipment and fleet management, sport scheduling, budget monitoring, and much more. Our planning boards can accommodate class scheduling, athletic schedules, and much more, with numerous options for further customization. 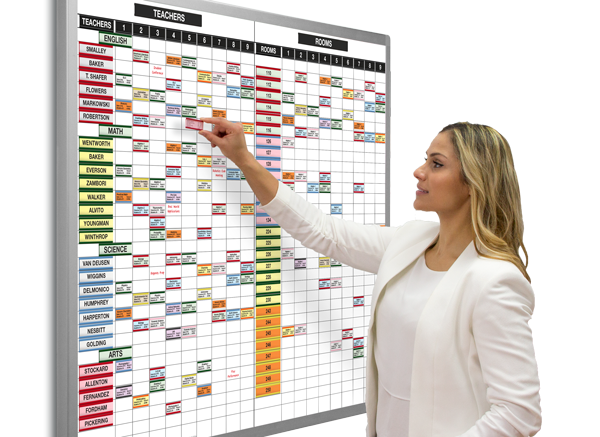 Our magnetic planning boards can handle your A-B alternating schedule days, teacher observation weekly schedule, and more. Our experienced design specialists are well-versed in our school dry erase boards and magnetic planning boards - let us help you select the right planning boards for your requirements, whether you need to keep track of lessons, test scores, or other important information. Avoid the hassle of working on small parts of your schedule on a computer or managing lots of little pieces of paper - use our planning boards for an immediate, easy-to-work-with, big-picture look at your needs and resources.